White Chocolate Mocha is a “smaller” F1 Golden Doodle (First Generation—one parent is a retriever and the other is a poodle) registered with the CKC (Continental Kennel Club). 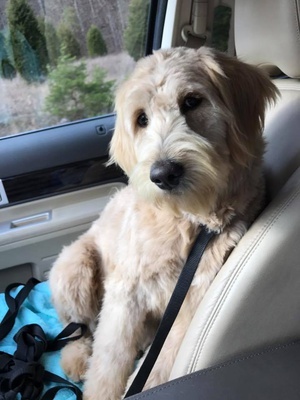 She is considered a standard Goldendoodle, but her parents were on the smaller side of traditional height and weight for Goldens/Poodles which brings her weight to around 50 lbs. She has such a charismatic personality and keeps us laughing. She was purchased from Jeanie’s Precious Darlings in Morehead, Kentucky.